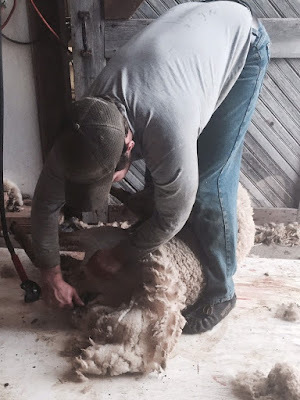 The first year we sheared sheep on the farm, we had no idea what to expect. We didn't have many sheep but we knew shearing was not a task we wanted to take on ourselves, so we hired a sheep shearer. We made it through our first sheep shearing experience, and many more since then. Over the years,we have learned a few things that make the job a little easier. 1. Confine the sheep. 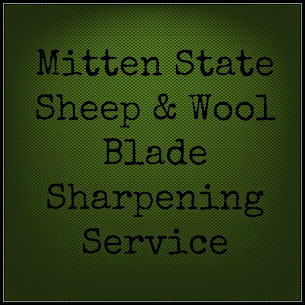 Our shearer works quickly, which is nice for all involved, but we have to be ready and keep things moving. The less space sheep have to run around, the less chasing you will have to do. I don't know anyone who likes to chase sheep. This year due to larger numbers, we had the sheep split into two groups. When one group was finished they were moved into the barnyard, and the second group was bought into the pen. Within the pen, we have a crowding gate and a chute,where two sheep are in line waiting for the shearer. While they are in the chute, we look them over to see if they need hooves trimmed. We also check overall body condition to see if their is need of some extra TLC before lambing. 2. Invite friends to help. If you have friends that don't mind getting dirty, and helping out, invite them over. We have friends that raise sheep, and we help each other out during shearing time. When we have the extra help, we can trim hooves, medicate (dewormer, vaccines) and skirt the fleeces as we shear. 3.Be organized. I like to get as much done as I can the day before. We set up pens, gather supplies, and have a place ready for the shearer to work, The holding pen is outside, but we are able to set up a shearing station in the barn. Everyone is assigned a job. Even when our kids were younger, they could do the small jobs such as putting labels on the bags of wool, or sweeping the shearing area between sheep. Sheep Shearing Day Supplies for us include tables- I have one set up inside for sharpies, labels, and large garbage bags for the skirted fleeces. Another one is set up outside by the sheep pen. Hoof trimmers, dewormer/syringes, chalk, (so we can mark who was given dewormer), I also have the skirting table set up, to put the fleeces on. Shearing for 2016 went well. The weather was nice (45 degrees, much better than last year's -2). We had plenty of help, and I was able to lightly skirt and bag the fleeces instead of throwing them on tarps, as I have had to do in years past. Hooves were trimmed, which doesn't always happen during shearing. The ewes were in good condition and being shorn makes lambing time a little easier. Glad it went well. Also, glad that Mother Nature was a little more friendly this year - makes it so much nicer. The weather has been much better this year than last :) I am grateful! I had my pens and chute set up perfect this year. Made a huge difference in stress for all of us :-). Nice post!